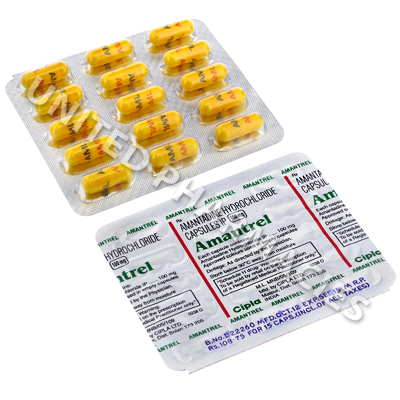 Amantrel (Amantadine Hydrochloride) is a type of antiviral medication which is used to prevent or treat influenza A infections. Its mode of action involves inhibiting viral activity. Treatment of Parkinson's disease is also possible with this medicine. Amantrel (Amantadine Hydrochloride) is a type of antiviral medication which is used to prevent or treat influenza A infections. Its mode of action involves inhibiting viral activity. Treatment of Parkinson's disease is also possible with this medicine. Medical experts are not fully sure of how it works for this condition, however it is believed to benefit patients by increasing dopamine levels in the brain so as to compensate for the reduced amount of dopamine which commonly occurs in Parkinson's patients. It can also function as an anticholinergic, and helps contribute to improved motor and muscle control while preventing excess activity of a neurotransmitter called glutamate. Many patients affected by MS (multiple sclerosis) have used it to relieve chronic fatigue syndrome caused by this condition. Amantrel (Amantadine Hydrochloride) comes as capsules which contain 100mg of the active ingredient. Deciding the correct dosage will be the responsibility of your doctor. Adults affected by Parkinson's disease who are being treated with this drug as a monotherapy may sometimes be told to take 100mg by mouth, twice per day. However, some patients (such as those affected by certain medical conditions or patients being treated with other medicines) may be told to take 100mg once per day. The doctor providing treatment may decide to increase this to 100mg twice per day if necessary. Do not take more than your doctor recommends. If you notice any side effects after administration of the medicine, it is important to inform your doctor. Patients should note that treatment with this medicine can sometimes cause patients to experience severe side effects which have the potential to severely damage the health. You must go to the hospital immediately if you experience feelings of anxiousness, urination problems, a sudden body weight increase, hallucinations, tremors or any other reactions which have not been listed here. This medicine can make you dizzy or lightheaded if you rise too quickly from a seated position or if you are lying down. In order to prevent this, you should take care and get up slowly so as to avoid the risk of falling down. Patients affected by Parkinson's disease may be directed not to abruptly cease treatment due to the risk of their symptoms becoming worse. It is possible that the patient will be told to reduce their dosage over a specified period of time. Always use Amantrel (Amantadine Hydrochloride) as you have been prescribed by your doctor. Never self-medicate or change your dosage without first consulting your doctor. The correct dosage can vary depending on your health, medical history, and the severity of the condition being treated.